Citation: Frank O, Boisa N. The effect of crude oil spill on the surface water of the Lower Niger Delta (Sombriero River). J Ind Environ Chem. 2018;2(2):19-24. The Niger Delta is an area of intensive and extensive crude oil exploration, exploitation and production and there are industrial installations like pipeline materials, flow stations, gas clusters and gas flaring sites; all of which have adverse impact on the environment . Crude oil spillage is a major environmental problem associated with oil exploration and exploitation activities. It has also caused regional crisis in the Niger Delta in onshore areas where most pipelines and flow lines are laid above the ground. Pipelines which have an estimated life span of about fifteen years are old and susceptible to corrosion. Most of the pipelines are as old as twenty to twenty-five years. Even Shell Petroleum Development Company (SPDC) admits that ‘most of the facilities were constructed between the 1960s and early 1980s at the then prevailing standards’ . The major impact of oil spills are destruction of farmlands, soil fauna and flora Figure 1a, poisoning of both surface and ground water Figure 1b, destruction of aquatic life and other economic livelihood . Figure 1: (a) Sombriero vegetation (sediment) devasted by crude oil. (b) Sombriero river water surface (c) Sombriero river by Degema/Abonnema (Pix: March, 2018). (d) Sombriero river by Bille. Crude oil spill can pollute streams and rivers and can have a devastating effect on the water environment by spreading over the surface in a thin layer Figure 1b that stops oxygen getting to the plants and animals that live in the water. It harms insect and animals such as periwinkles, crabs and crayfish; prevents photosynthesis in plants, disrupts the food chain and takes a long time to recover or remediate. Animals such as are particularly vulnerable . Moreso, fishing which are the traditional occupation and the people’s source of income is being eroded as a result of crude oil spills. Many affected residents especially in the worst affected areas have not recovered from the loss of their livelihood and income from the effect of crude oil spill . The Sombriero River drains the western part of Rivers state  and it is within the estuarine mangrove zone with tropical rain forest Figure 1 . The vegetation of the Sombriero River is mangrove forest which is included in a highly complex trophic system  and fringes the river at the left and right banks consisting of mangrove trees (Rhizophora, Avicennia and Nypha fruticans) arising from a characteristic muddy substrate that produces a foul odour which once served as a source of both fuel wood for indigenous people and a habitat for biodiversity has now oil toxicity that had depleted and devitalize the ecology Figure 1c . The volatile, quickly penetrating viscous properties of crude oil have wiped out large areas of vegetation. The loss of vegetation occurs when spill happens close to and within the drainage basin and the hydrologic force of both the river and tides forced spilled crude oil to move up into the areas of vegetation  but when it occurs near the shore, the whole adjourning district is invaded by nauseating pungent smell as air current carries volatile components for a distance. The risk of fire is also high as ship and boats that mowed near the habour are warned to leave the affected areas. Moreso, swimming and other recreational activities are suspended from the water body (river) due to the spill . The physicochemical characteristics of water are vital as they may directly or indirectly affect its quality and subsequent suitability for the production and distribution of fish and other aquatic lives . Also, the level of heavy metal toxicity on estuarine organisms affects the physicochemical composition of the ecosystem . Hence, the essence is to compare the present results to the baseline data and deduce possible causes and how to prevent it. Sombriero River is located across six (6) Local Government Areas of Rivers State (Akuku-toru, Degema, Asari-toru, Abua- Odual, Ikwerre and Emohua) between Latitude 4º 22' 47'' N and Longitude 6º 52' 20'' E. It is a distributary of the River Niger which drains into the Atlantic Ocean connected to other rivers via creeks in the coastal area of Niger Delta Figure 2 . Figure 2: Map of study area. The sampling was carried out during the dry season of March 2018 in order to secure the river specific conditions rather than those modified by the rains (run-off) rainy season. The sampling points for each location were 500 meters apart- along the stretch of the Sombriero river axis of Bille, Abonnema and Degema. These sites were chosen because they are the frequently used transportation routes for ferrying crude oil. The composite samples were obtained by sampling from the entire sampling stations. The sampling containers used were washed, rinsed with 1M Nitric acid after which they were severally washed with demineralized water and finally with the sample solution before collection of samples for analysis. The samples were collected with a 2L plastic hydro bios water sampler and transferred to clean 2L polyethylene containers with screw caps. Samples used for heavy metals were preserved by the addition of 4mL concentrated nitric acid. All the samples were transported in an ice-chest to the laboratory and preserved in a refrigerator at 4ºC. The samples were analyzed within 24h of arrival. The physicochemical parameters analyzed were pH, electrical conductivity (EC), alkalinity, turbidity, total suspended solids (TSS), total dissolved solids (TDS), chloride, orthophosphate and total hardness (TH) using standard methods for examination of water and waste water (APHA and ASTM). The aliquot heavy metals of Iron (Fe), Zinc (Zn), Copper (Cu), Chromium (Cr), Cadmium (Cd), Nickel (Ni) and Lead (Pb) were concentrated and analyzed with Perkin Elmer AAnalyst 200 Atomic Absorption Spectrophotometer. The results of the physicochemical properties and heavy metal parameters of the Bille, Abonnema and Degema axis of the Sombriero River are presented in Tables 1 and 2 and Figures 3 and 4. The appearance/color of the water at Bille was darkish brown with hydrocarbons odour while at Degema/Abonnema was cloudy. The pH of the samples was within the specification as reported earlier . The electrical conductivity as compared to 2010-2012 reduced significantly at Degema and Abonnema but was almost same for Bille location. This is in contrast with Ezekiel et al. 2011 who reported as high as 18730.58μS/cm. The alkalinity increased almost ten times as compared to the baseline report and it is not harmful to aquatic life and humans . Turbidity, total suspended solids and total dissolved solids also increased exponentially as compared to baseline result. The chloride content and total hardness reduced significantly and minimally. This may be the reason why the electrical conductivity reduced as well. No significant difference observed in terms of phosphates and this is in agreement with ; that, the concentration of phosphate is low in surface waters. Figure 3: Comparison of the physicochemical parameters in Sombriero River of 2010, 2011, 2012 & 2018. (a) Alkalinity (b) Chloride and Total Hardness (c) PH and Electrical conductivity (d) Turbidity, TSS, TDS and O-PO43-. Figure 4: Comparison of heavy metals in Sombriero River of 2010, 2011, 2012 & 2018. (a) Iron and Chromium (b) Zinc, Copper, Cadmium, Nickel and Lead. Table 1. Chemical parameters in Sombriero River (Bille, Abonnema & Degema axis) 2018. Table 2. Comparison of mean Chemical parameters in Sombriero River (Bille, Abonnema & Degema axis) 2010-2012 and 2018. For heavy metal concentration, Fe content was slightly affected in 2018 as the concentration level in the water was lower as compared to 2010 but higher than 2011 and 2012. The Zn and Cu concentrations in 2018 also increased whereas the Cr, Ni and Cd concentrations were within the same concentration levels with 2010, 2011 and 2012 but Pb concentration reduced within the five years difference being investigated. The heavy metals showed the following order: Cr>Fe>Zn>Cu>Ni>Pb>Cd. The adverse effects of heavy metals on aquatic life and humans varies in that, the heavy metal pollution of aquatic environment inhibits primary production, nitrogen fixation, litter decomposition, mineralization of carbon and biological process in the water as reported [13-15]. The study provided information on the effect of crude oil spill in 2018 on the Sombriero River as compared to 2010, 2011 and 2012 with increased concentrations of alkalinity, turbidity, total suspended solids, total dissolved solids, Fe, Zn especially Cu and Cr that are carcinogenic which can affect humans through the food chain but showed relatively reduced concentrations of electrical conductivity, chlorides, total hardness and Pb which indicated that, the ions present in the water might have reacted with the crude oil. However, efforts should be geared towards ensuring that, the crude oil spills are prevented/reduced to the minimum by improvement of asset integrity management (routine testing and inspection, upgrade of flow station and facilities, replacement of flow line with defects), surveillance by host communities, awareness campaigns as to dangers involved in illegal bunkering, enhanced communities interactions and the presence of Military Joint Task Force. Manilla PN, Frank OM. 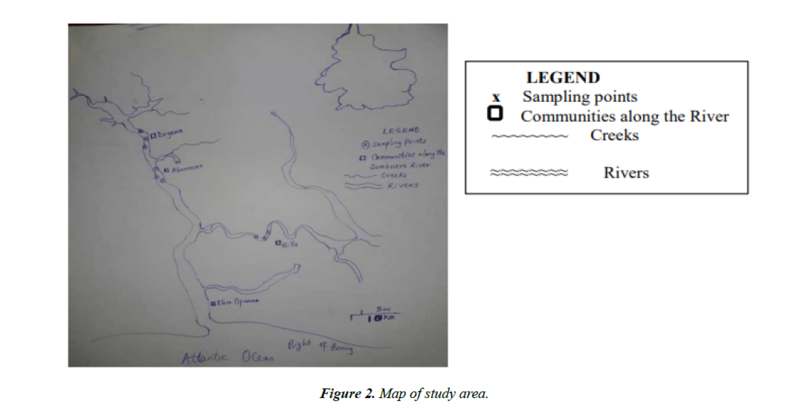 Chemical analysis of water samples from some flood plain lakes in the Niger Delta, Nigeria. Asian Journal of Microbiology, Biotechnology, Environmental Science. 2009;11(3):483-7. Agunobi KN, Obienusi EA, Onuoha DC. 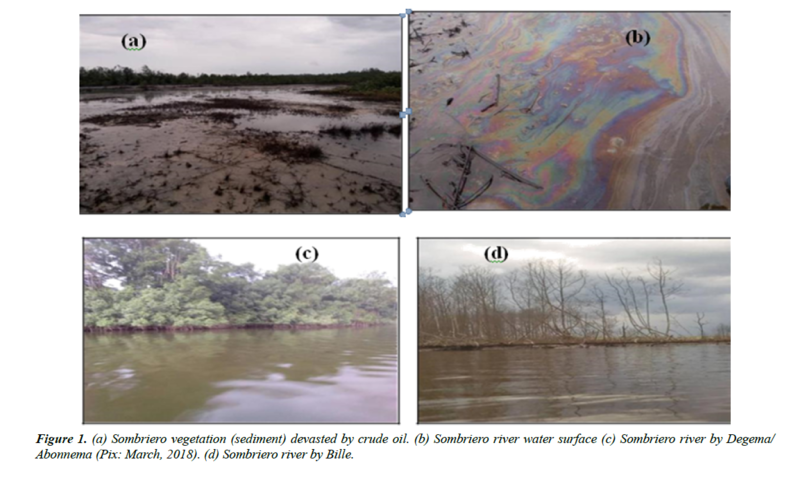 An investigation of the pattern and Environmental impact of oil spillage in Etche Locval Government Area of Rivers State, Nigeria. Journal of Natural Resources. 2014;4(16):124-37. Nwilo PC, Badejo OT. Impacts and management of oil spill pollution along the Nigerian Coastal areas. International Federation of Surveyors, 2007. Nestor PB. The News Today. 2007. Ezekiel EN, Abowei JFN, Hart AI. The fish species assemblage of Odiokwu-Ekpeye flood plains, Niger Delta. International Journal of Science and Technology; 2002;1(1):54-9. Ezekiel EN, Hart AI, Abowei JFN. The physical and chemical condition of Sombriero River, Niger Delta, Nigeria. Research Journal of Environmental and Earth Sciences. 2011;3(4):327-40. Janice L. Indigenous Plants to the rescue Environmental remediation in Nigerian oil regions. Science in Africa, 2002. 2007. Okonkwo EM, Eboatu AN. Environmental Pollution and Degradation. Onis Excel, Palladian Zaria. 1999;5(5):53-62. Moses BS. Introduction to tropical fisheries, Ibadan University Press, UNESCO/ICSU Part, 1983;102-05. Oyewo EO, Don-Pedro KN. Influence of salinity variability on heavy metal toxicity of three estuarine organisms. Journal of Nigerian Environmental Science. 2003;1(2):141-55. Trivedy RK, Goel PK. Chemical and biological method for water pollution studies. Environmental publication. 1986;6:10-2. Ogan MT. Examination of surface waters used in the Port Harcourt area II. Chemical Hydrology -Arch. Hydrobiology Supplementary. 1988;29(2/3):325-42. Forster U, Wiltman GTW. Metal Pollution in aquatic environment. 2nd edition. Springer-Verlag, Berlin. 1983;486. Suffern JS, Fitzgerald CM, Szluha AT. Trace metal concentration in oxidation pond. Journal of Water Environment Federation. 1981;53:1599-607. Babich H, Stotsky G. Heavy metal toxicity to microbe-mediated ecologic process. A review and potential application to regulatory policies. Environmental Research. 1985;36:111-5.